My task this evening is to address the topic of the Role of the Theotokos in the Orthodox Church. This is not easy, especially in so short a time. We have two thousand years of Church History and two thousand years of the Theotokos’ involvement in that Church History. I certainly am not going to say it all in a few minutes. In addition we are expected to increase our alms-giving, because of the decrease in spending on foods and luxuries. Thus we bring our passions under control through our fasting and we help those who may not have even the barest minimum of food. There is also a major change in the way we worship and pray. We celebrate the Divine Liturgy of St. Basil the Great on Sundays instead of the Divine Liturgy of St. John Chrysostom. We have the Liturgy of the Presanctified Gifts on Wednesdays and Fridays, and Great Compline on Mondays, Tuesdays and Thursdays. All these services take on a penitential character which is especially reflected in the use of the Prayer of St. Ephrem. On the first five Fridays, we sing The Akathist Hymn, composed of twenty-four stanzas which relate various incidents in the life of the Theotokos. The first four weeks we do six stanzas each week, the first six on the first Friday, the second six on the second Friday, etc. The fifth and final Friday we do all twenty four stanzas, interspersed with the Odes of the Canon of the Mother of God. It is not possible for me to go into great detail here. I recommend that you read the Akathist hymn at home and that you attend its celebration in Church in order for you to derive benefit from its poetry and theological teaching. You should not think that the Akathist Hymn is limited to the time of Great Lent. It can be prayed at home throughout the year. 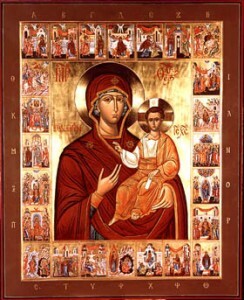 The value and importance of the Akathist Hymn, is found in each one of us listening not so much to the poetry and composition but in bringing our souls in tune with the example of Christ and the Theotokos which we find so beautifully presented. In addition, just as Christ and the Theotokos in the events of their lives together, as mother and child, unmistakably moved forward to the ultimate purpose and reason for the Incarnation, each week we realize that we are moving closer, in our spiritual steps of the long and difficult Lenten period, eventually to the goal of Great Lent, which is the Lord’s Glorious and Light-filled Resurrection. Mary’s meaning for the Orthodox Christian lies in this, that she is the first and most perfect example of God’s plan and design for the whole Church and for each individual Christian. Because she is Theotokos, that is the Mother of Lord, she is also the first and highest among the saints. She is a model not only for women, but indeed for all Orthodox Christians, men, women, young people, children, senior citizens. As we listen to the Akathist Hymn we learn something about Mary as we consider the fact that God chose her to bear His Son, Jesus Christ. She is “full of grace” a special condition and state of life granted to her by God; “the Lord (is) with thee.‎” and she has “found favor with God.” Because of this the angel was able to relate God the Father’s message to her “behold, thou shalt conceive in thy womb, and bring forth a son, and shalt call his name JESUS. When we are talking about Mary, we are saying something about ourselves, we are proclaiming the Christian ideal of humanity. She is the perfect Christian. In her life and person she shows perfectly what it means to believe, to love and be loved, to be graced, to be saved. The scriptures tell us that she was “full of grace”, that the “Lord was with her” and that she had “found favor with God” (Luke 1:28, 30). For God to have chosen this woman above all others to be the Mother of His son, she had to be a special person, in loving God, in devotion to prayer, in personal commitment to God, and in communion with Him. She gives us the example of a total and freely given acceptance and conformity to the will of God. She could have said no – and where would be today if she had said no? But instead she gave us yet another example to follow. She refused to display a blind and unreasoning faith, but instead she demonstrated a faith that engages the entire person. She asked questions and when she had assured herself that this was indeed the will of God for her, she said yes! This is an example for each of us to follow.